If you didn’t already know, I’m a HUGE wine fan, especially local wine. Well, you can’t really get more local than Brooklyn wine can you? Last night I had the opportunity to visit the Brooklyn Winery in Williamburg, sample some of their wine and take a tour. A must do for any Brooklyn tourist OR local! Okay, let’s get to the wine. 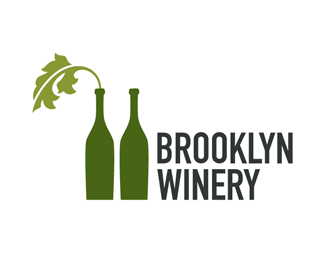 Brooklyn Winery opened about two years ago and produces a collection of wines on site. Obviously there aren’t acres of grapes growing all over Brooklyn. Rooftop gardening is making advances, but it isn’t that good yet. Brooklyn Winery sources the majority of their grapes from the New York wine regions, the North Fork of Long Island and the Finger Lakes. They also source some grapes from California to fill in the gaps of their wine needs that don’t grow as well in NY, like Pinot Noir and Zinfandel. When I arrived at Brooklyn Winery, I was first greeted by a trendy, yet rustic ambiance. The walls were wooden planked and felt very modern. Yet, the place was decked out with long wooden communal tables with long benches or metal seats. Centerpieces of flowers and branches in wine bottles adorned each table. In addition to the bar downstairs there was a beautiful indoor atrium like room with plenty of sun shining through. They host wedding at the winery and I can just imagine how beautiful a ceremony would be there. Upstairs there was a smaller bar (where we were) overlooking the barrel room, as well as some small cozy nooks with comfy leather couches. It was the kind of place I could imagine myself happily chatting with a group of friends, invading one of those tiny corner nooks, or sitting alone at the bar with a good glass of red. Now, yesterday was hot. I mean, not HOT, hot, but humid and sticky. The kind of day I might have actually considered owning a car again to drive around, AC blasting, rather than walking or even worst, going down into the subway. I welcomed a glass of Rosé of Old Vines Zinfandel when I arrived. The rosé made from 50-year-old Zinfandel vines. It is crisp and with hints of fruit but still remains relatively dry. While sipping on your wine, you can also embark on a tour of the winery: Wednesdays at 7pm, 8pm or 9pm and Sundays at 2pm, 3pm or 4pm. If you don’t know anything about wine making, the tour is extremely informative. But even if you are an “expert” in wine, I guarantee you’ll still learn something. The tour was very well delivered and paced and our guide took the time to answer a LOT of questions. One disappointment, was when I went to try another glass, maybe a crisp white or full bodied red, I learned that the rosé was the only of Brooklyn Winery’s own wines they were serving at the moment. Now given, the winery does have a a large selection of New and Old World wines to round out their bar, but I was most interested in trying their own vintages. Perhaps another time. I should also mention, being in Williamsburg and being the only other winery in Brooklyn, you’re paying a bit of a premium. The place is not cheap. My glass of rosé was $12 after a $2 Brooklyn Wine Happy Hour discount. Reviewing the menu later, I noticed glasses range from $10-16, with most wines (especially their own) on the higher end of that scale. I was also shocked to see their own bottle prices. Most were in the $50+ range. Now given, I’ve only tried that one rosé, but I didn’t think a bottle was worth $56. I’ve had a lot of good New York Wines from all over the state and I find a lot of fantastic wines in the $20-30 range. The setting is comfortable and a great place to have a few glasses with friends (and events–check out their calendar), but I don’t know that I’d bring much home. Next postFeeling Peachy? Maybe a Bouquet of Lavender?